» A port is a location on a coast or a shore that contains one or more harbours where ships can dock. They are also used to transfer people and material to and from land. » India has a coastline spanning 7516.6 kilometers, forming one of the biggest peninsulas in the world. » According to the Ministry of Shipping, around 95 per cent of India's trading by volume and 70 per cent by value is done through maritime transport. It is serviced by 13 major ports, 200 notified minor and intermediate ports. 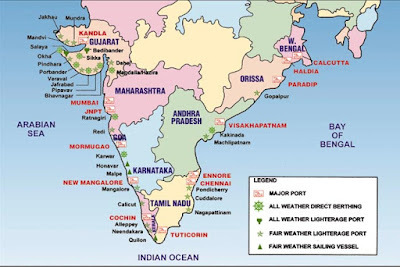 » The total 200 non-major ports are in the following States:- Maharashtra (48); Gujarat (42); Tamil Nadu (15); Karnataka (10); Kerala (17); Andhra Pradesh (12); Odisha (13); Goa (5); West Bengal (1); Daman and Diu (2); Lakshadweep (10); Pondicherry (2); and Andaman & Nicobar (23). Kolkata Port is the only riverine major port in India. It is also known for twin dock systems viz., Kolkata Dock System (KDS) on the eastern bank and Haldia Dock Complex (HDC) on the western bank of river Hooghly. Paradip Port is located at confluence of river Mahanadi in Bay of Bengal in Odisha. It was the first major port on East Coast commissioned in independent India. New Mangalore Port is located at a site called Panambur in Karnataka at Gurupura river confluence with Arabian Sea. Cochin Port is located on the Willington island on the South-West coast of India; located on the cross roads of the East-West Ocean trade This port is also called natural gateway to the vast industrial and agricultural produce markets of the South-West India. Jawaharlal Nehru Port is also known as Nhava Sheva and is the largest container port in India, handling around half of containers of all major ports. It is located on eastern shore of Mumbai harbour off Elephanta Island and is accessed via Thane creek. Mumbai Port is one of the oldest modern ports of India. Initially the location was used by navies of Shivaji. Kandla Port was built after partition as the Karachi port on western coast had gone to Pakistan. It is known for handling much of the crude oil imports of India. Vishakhapatnam Port (Vizag) is located in Andhra Pradesh and is known for bulk of Cargo handling on east coast. Chennai Port is the largest port in the Bay of Bengal and second largest port of India after JNPT. It is largest port at east coast. Tuticorin Port has been now renamed as V.O.Chidambaranar Port. It is located in the Gulf of Mannar. Tuticorin is the only port in South India to provide a direct weekly container service to the United States. Ennore Port is now named as Kamarajar Port Limited. It is first corporate port of India and is registered as a public company with 68% stake held by government. Mormugao Port in Goa is leading iron ore exporting port of India. Port Blair Port is the 13th and youngest major port of India declared so in 2010. The port is of strategic importance to India and is closer to two international shipping lines viz. Saudi Arabia-Singapore and US-Singapore. Which is the biggest Port in India? Jawaharlal Nehru Port in Mumbai is the largest port of India. When did the Inland Waterways Authority of India (IWAI) come into existence? The Inland Waterways Authority of India (IWAI) came into existence on October 27, 1986 for development and ordinance of inland waterways for shipping and navigation. The Authority mainly undertakes projects for development and maintenance of IWT infrastructure on national waterways through grant received from Ministry of Shipping. The head office of the Authority is at Noida. The Authority also has its regional offices at Patna, Kolkata, Guwahati and Kochi and sub-offices at Allahabad, Varanasi, Bhaglapur, Farakka and Kollam. Which is the largest Port in the World?